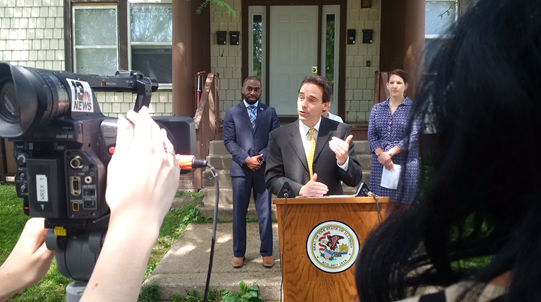 Human service providers joined State Senator Steve Stadelman last week in a news conference to call on Gov. Bruce Rauner to release $700 million in funding for some of Illinois' most vulnerable citizens -- children, the elderly and those who are mentally ill or homeless. Senate Bill 2038, which Republicans and Democrats passed unanimously in both chambers of the General Assembly nearly a month ago, is still sitting on the governor's desk. The bill would appropriate funds from a rainy day account established by the legislature in 2010 and have no effect on the current budget impasse. Representatives from the YMCA, Rosecrance and Shelter Care Ministries spoke about the dire consequences political gridlock in Springfield has had on those who are less fortunate in our community. The news conference took place in front of a four-unit apartment building, which Shelter Care Ministries was forced to convert from housing for families who were homeless to market-rate rentals because of delays in state funding. Money from SB 2038 would go to after-school and senior programs such as Meals on Wheels among other popular programs that save taxpayer dollars in the long run by the elderly out of nursing homes and kids off the streets. In many instances, the state owes money to private business that provide human services such as in-home health care. School funding remains the top priority for Illinois Senate Democrats as lawmakers and the governor continue trying to negotiate a balanced budget. "The students and parents of our state should not have to stress out all summer about schools opening this fall," Senator Steve Stadelman said. "Eliminating the uncertainty around education funding is the first step toward economic stability in Illinois." Stadelman's comments came as Senate Democrats pushed a clean state budget for public schools. The legislation, HB2990, had no financial strings attached and, unlike many other budget proposals, was not part of any outside political agenda. While endorsed by Senate Democrats, the plan didn't clear the Illinois House before lawmakers adjourned and now is among proposals on the negotiating table. The clean education budget favored by Senate Democrats would ensure no school gets less state funding than it currently receives and guarantees the state's "foundation level" for adequate funding is fully funded. An additional $700 million in funding would targeted for schools in communities including Rockford that face the greatest economic and social challenges in providing educational excellence. Stadelman said he is hopeful lawmakers and the governor can agree on a stopgap budget that not only funds schools but keeps state government operating for six months from the end of the fiscal year June 30 through the end of 2016. Insurance companies would have to provide coverage for most FDA-approved contraceptive drugs, devices and products under legislation supported by State Senator Steve Stadelman. "Women utilize contraceptives for many different reasons," said Toi Hutchinson of Chicago Heights, who advanced the bill in the Illinois Senate. "The most obvious reason is for birth control, but for many women, contraceptives play a key role in our overall health. Government should ensure that women have access to all forms of contraceptives without intrusion by insurance bureaucrats or politicians." The bill, which now sits on the governor's desk awaiting his signature, additionally would require insurance companies to provide up to 12 months of contraceptives at one time. Currently, they're only required to cover one contraceptive in each drug class, leaving out a host of medical options for women who must try multiple forms of birth control before finding the right one.